ELEAGUE, the premium esports content and live tournament brand from Turner and IMG, today announced the commentary team for its second Street Fighter® V: Arcade Edition professional tournament, the ELEAGUE Street Fighter® V Invitational 2018. Tournament action will throw down beginning Friday, June 1, at 11 p.m. ET on TBS, with live coverage starting at 3 p.m. on the ELEAGUETV Twitch channel. 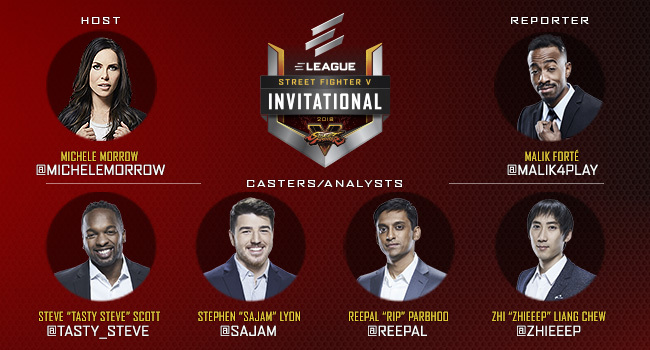 The commentary team will be anchored by popular fighting game experts and ELEAGUE regulars Steve “Tasty Steve” Scott, Stephen “Sajam” Lyon, Reepal “Rip” Parbhoo and Zhi “Zhieeep” Liang Chew. ELEAGUE will also welcome rising esports personality Michele Morrow as desk host for the first time. Reporter Malik Forté will complete the lineup as he returns to ELEAGUE to provide the latest from the 24 players who will compete on the ELEAGUE stage. The Preview Show will reveal the four competition groups – each of which will send the top two of its six players to the Playoffs – as well as catch fans up on what makes the Fighting Game Community (FGC) unique, along with its history. The show will also feature originally-produced vignettes focusing on Jonathan “JB” Bautista – who earned his tournament spot by winning ELEAGUE’s first-ever reality show ELEAGUE The Challenger: Street Fighter V – and the epic Grand Final from last year’s Invitational (seen in the preview clip accessible by clicking the image above). Finally, the commentary team will take a look at the initial matchups as the world’s best prepare to meet again at ELEAGUE. Media members interested in credential access to cover the Invitational, beginning June 1 at ELEAGUE Arena in Atlanta, can contact Turner Sports PR at turnersportspr@turner.com or (404) 575-6765. Opportunities to cover the event remotely, including via media teleconferences with players, will be available on a weekly basis.